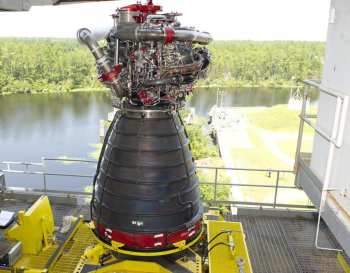 The Stennis Space Center is just weeks away from returning to RS-25 engine testing, following the installation of Engine 0525 on the A-1 Test Stand. The milestone comes as the launch date for the first Space Launch System (SLS) mission – Exploration Mission -1 (EM-1) – is almost certain to slip by at least six months, with weight issues for Orion’s re-entry the latest claimed issue. 45 years after five F-1 engines powered the Saturn V uphill on the historic Apollo 11 mission, the SLS program finds itself deep into preparations for testing the RS-25 engine – four of which will be tasked with lofting the monster rocket uphill on missions that NASA claim will eventually head to Mars. This engine has already proved its worth, ably assisting the Space Shuttle to orbit during a near-spotless 30 year career. Now – after being saved as part of the transition to a Shuttle-Derived Heavy Lift Launch Vehicle (SD HLV) – the remaining set of engines will be allowed to roar one final time during a mission. They will end their lives at the bottom of the Atlantic Ocean. The first mission, known as EM-1, is still officially manifested for December 15, 2017. However, internally that date has all-but been ruled out. Notably, Orion’s recent delta Preliminary Design Review (PDR) kickoff meeting actually claimed 500lbs of margin for entry. There are also understood to be issues with ESA’s schedule per the Service Module work. 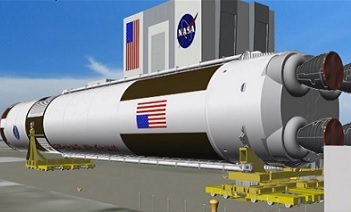 A slip from 2017 is not as big an issue as may be assumed, given that date was a throwback to the 2010 Authorization Act, political language that required SLS and Orion to be ready by that date to support NASA’s International Space Station (ISS) crew transportation needs in the event the Commercial Crew Program (CCP) suffered a major schedule slip. While the first NASA crew to ride to the ISS – on a mission called USCV -1 (US Crew Vehicle -1) – has since slipped to 2017, it was never totally viable for the overpowered and highly expensive SLS to conduct such a Low Earth Orbit (LEO) crew run, not least because the debut launch of the new rocket has to be an uncrewed test flight for crew safety reasons. Ironically, at least one schedule presentation notes (L2) shows the next mission – Exploration Mission -2 (EM-2) – is set to move forward by six months. That schedule shows EM-1 launch date as September 30, 2018, followed by the Ascent Abort (AA-2) test – required for crew launches – on December 15, 2019, followed by EM-2 on December 31, 2020. As to when such dates may become official, it could be as late as next year before NASA officials stop saying “2017”. This is due to a disconnect between Orion and the other Exploration elements on their current schedules. While sources note NASA HQ has been briefed on the slips, the goal is for the Program to be on the same schedule path by the spring of 2015. For EM-1, NASA’s Liquid Engine Office has already selected the first four engines (L2) that will loft the monster rocket uphill. 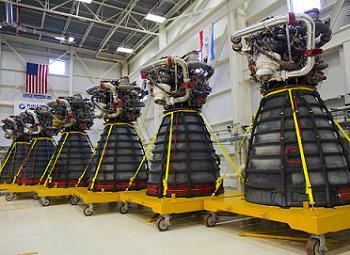 These engines are scheduled to be delivered from their current home at the Stennis Space Center to the Michoud Assembly Facility (MAF) in New Orleans at one-month intervals beginning in September 2015. SLS will see the engines being installed into the core stage at MAF, ahead of being shipped to the Kennedy Space Center (KSC). After the last of those engines are delivered in December 2015, four more engines will be prepared and tested as contingency engines, to be available in case one or more of the first four engines need to be replaced. These contingency engines will be ME-2047, ME-2059, ME-2062, and ME-2063. Providing there are no problems with the EM-1 set, these next four engines are now all-but confirmed as being the engine set for SLS’ second mission into space, which may become a specific payload mission in 2019, if funding is found for the “extra” SLS. 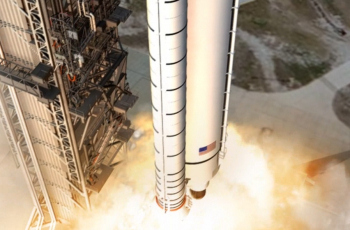 This intermediate mission may debut the new Exploration Upper Stage (EUS) ahead of what could become SLS’ third mission, Exploration Mission -2 (EM-2). EM-2 is set to be the first launch of a crewed Orion, on a mission to explore a captured asteroid near the Moon. Prior to the testing of the flight RS-25s, the first engine that is gracing the test stand for the opening tests of the RS-25 for SLS is Engine 0525. 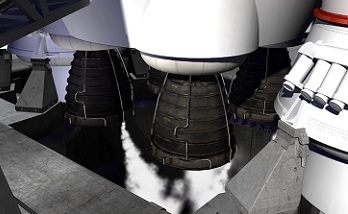 Final testing was conducted in 2009, with engine 0525 earmarked for any hot-fire tests that may have been required to support the final STS missions during 2010. This engine was officially installed into the A-1 test stand on Thursday. “This test series is a major milestone because it will be our first opportunity to operate the engine with a new controller and to test propellant inlet conditions for SLS that are different than the space shuttle,” noted Steve Wofford, SLS Liquid Engines Element manager. The Stennis team will perform developmental and flight certification testing, collecting data on the performance of its new advanced engine controller and other modifications. 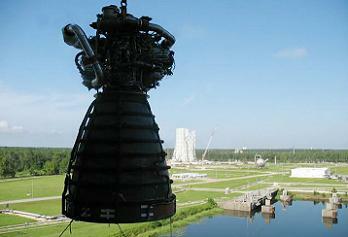 “Installation of RS-25 engine No. 0525 signals the launch of another major rocket engine test project for human space exploration on the A-1 Test Stand,” added Gary Benton, RS-25 rocket engine test project manager at Stennis.